Attached 2 examples from a set of blueprints for the CAPE GIRARDEAU (23-35) plus a photograph of her from La Crosse. Designed by Tom Dunbar for the Eagle Packet Company. Built in 1923 at Howard Ship Yard, Jeffersonville, Indiana. Went from Louisville to St. Louis in November, 1923. Came out in the St. Louis-Cape Girardeau commerce trade in April 1924; christened at Cape Girardeau on August 24 by Miss Christine Rowling. Made St. Louis to New Orleans Mardi Gras trips between 1925 and 1930. Sold to Greene Line Steamers in 1935 and became the GORDON C. GREENE. LOCAL WORKS BELOW KANSAS CITY, MO. SHOWING LOCATION OF BANK-HEADS 4F, 5 F, AND 6F, COMPLETED DURING THE FALL OF 1897 AND WINTER OF 1898, AND THE CONDITIONS OF FLOW. 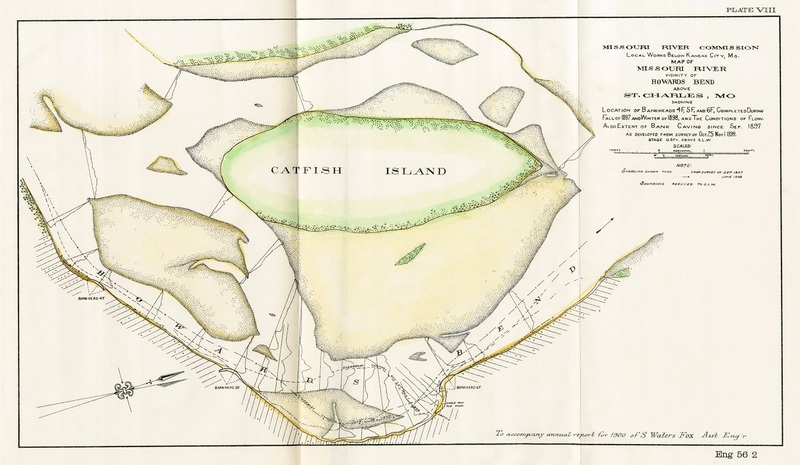 AS DEVELOPED FROM SURVEY OF OCT 25TH - NOV.1ST, 1899. I bought these plans some years ago and had them mounted on linen. They came in two sections and the outfit that mounted them didn't line them up properly so about half way through the pilot house there's a "jog" where the horizontal lines don't match up. They went in with pen and ink and paint brush to try and disguise this but it made it look ever more obvious. Mississippi River Commission. 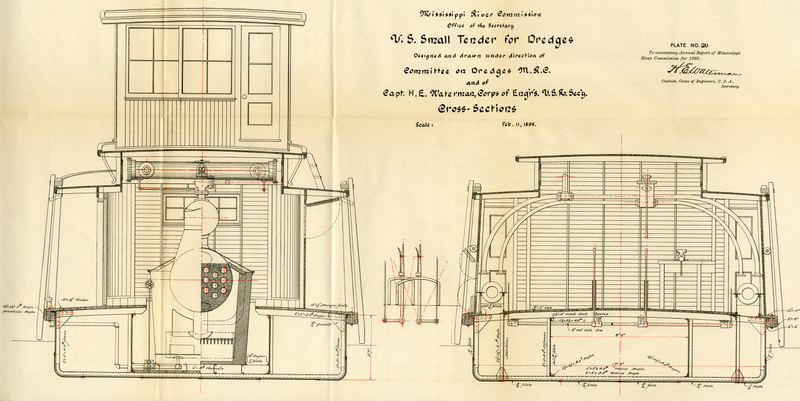 U.S. Large Tender For Dredges, Designed and drawn under direction of Committee on Dredges M.R.C. and of Capt. H.E. Waterman, Corps of Engineers, U.S.A. Secretary. Longitudinal Section... Plate No. 13 to accompany annual report of Mississippi River Commission for 1898. 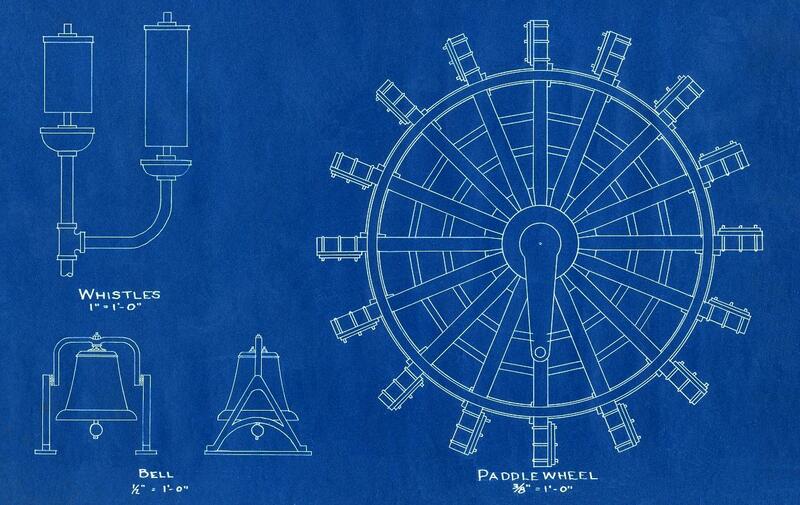 Plan by Percy H. Middleton, 55 x 17.75". Office of the Secretary, M.R.C. Washington, DC. 1898, Jan. 28. 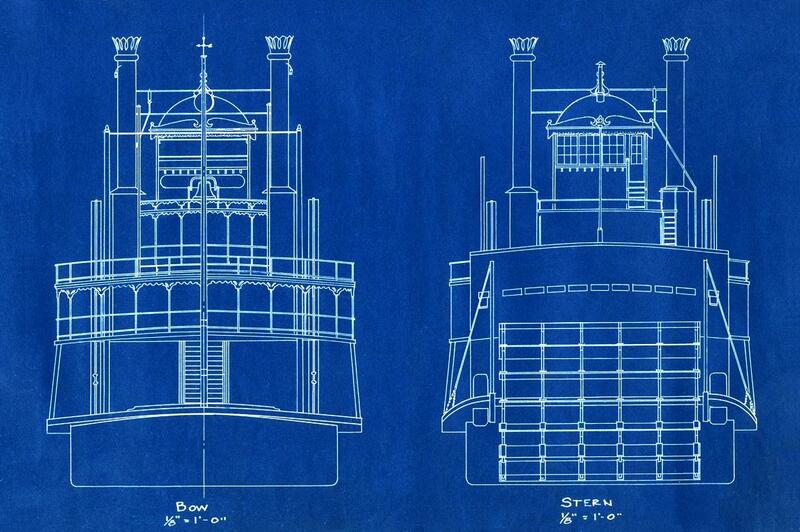 "This is a very detailed drawing of a steamboat. Leave it to the engineers to spend so much time on a drawing. It is a nicer looking boat than most of the boats they built. Seems I have seen a photo of a similar boat, maybe at the Memphis fleet. 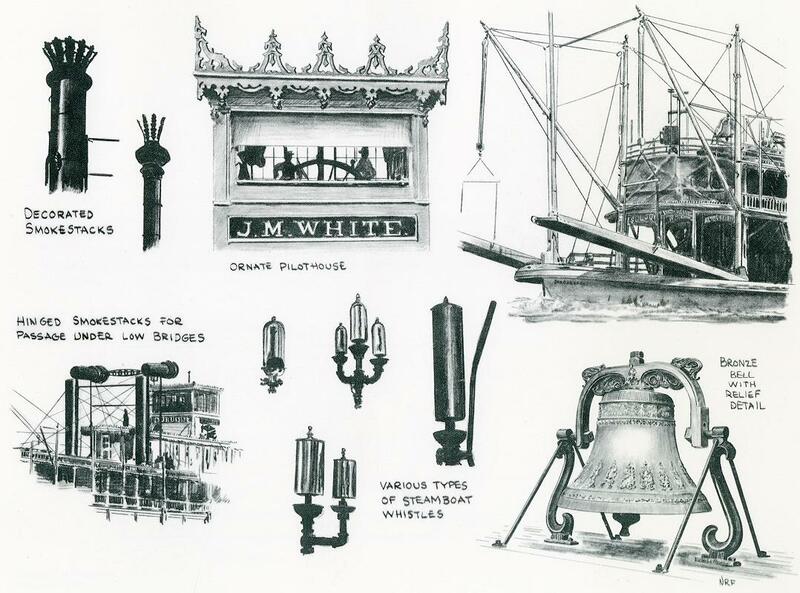 I wish Howards had made such detailed drawings of the boats they built. Their drawings were just basic outlines at best. I like the bath tub and the little overhang at the stern for the toilet. Mr. Richardson told me when they reversed the wheel it turned the toilet into a bidet." Editor's Note: Please visit Steamboats.com's new model boat page - click here. 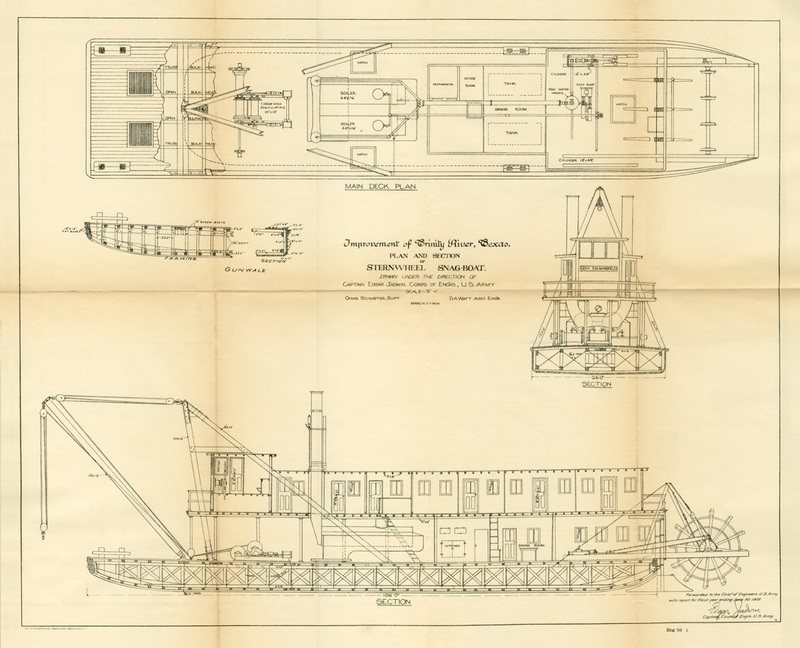 U.S. Small Tender For Dredges, Designed and drawn under direction of Committee on Dredges M.R.C.and of Capt. H.E. Waterman, Corps of Engineers, U.S.A. Secretary. to accompany annual report of Mississippi River Commission for 1898. Office of the Secretary, M.R.C. Washington, DC. 1898, Jan. 28. 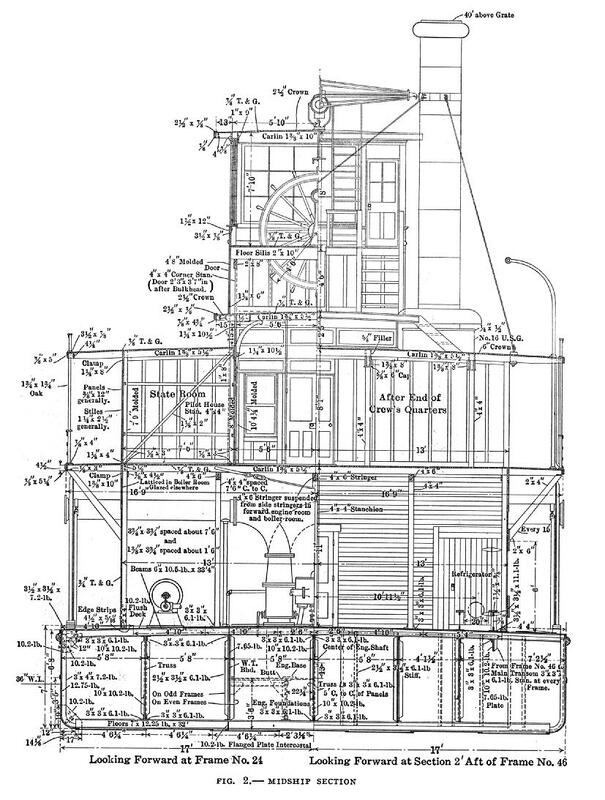 For the do-it-your-self'er attached one of the sure 'nuff Gee-Whiz cross-section drawings from which the Red River Hydraulic dredge WATERWAY was built. This illustration appears on page 436 of the journal International Marine Engineering for November, 1912. On page 477 there is also a profile drawing and a deck plan. 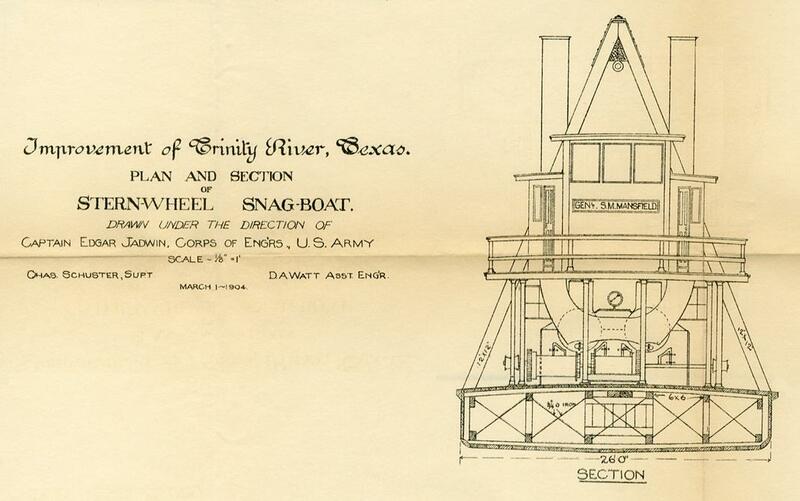 "Early in the summer of this year the Dubuque Boat & Boiler Works, Dubuque, Iowa delivered to the United States Engineers at Vicksburg, Mississippi, the steel self-propelled hydraulic dredge WATERWAY. The dredge is a steel hull boat fitted with the ordinary type of sternwheel towboat machinery, and a sand hydraulic pumping plant for river dredging." For those interested in reading the article in its entirety it is available on line from Google books. My favorite is the one on the last page entitled "Packet Portfolio" with vignettes of stacks, whistles, bell and pilot house. Forwarded to the Chief of Engineers, U.S. Army with report for fiscal yeard ending June 30 -1905 Edgar Jadwin - Captain, Corps of Eng'rs, U.S. Army"
Three photos and an elevation drawing of the attractive little steamer which began as a private boat for the Mayo Brothers named the MINNESOTA with an intermediate 21 year stretch as the GENERAL ALLEN before being given back the name MINNESOTA again. Below are Fred Way's biographies—he assigned the boat one number in his Packet Directory and two different numbers in his Steam Towboat Directory (for both MINNESOTA and GENERAL ALLEN). Original price $30,000. Home port, 1916, St. Paul, Minnesota. She was built in 1915 and launched in 1916. She was built in 1915 at Jeffersonville, Indiana by Howard Ship Yard for the physician partners, Mayo brothers (Dr. Charles Horace Mayo, Dr. William James Mayo) to replace their pleasure steamboat ORONOCO. 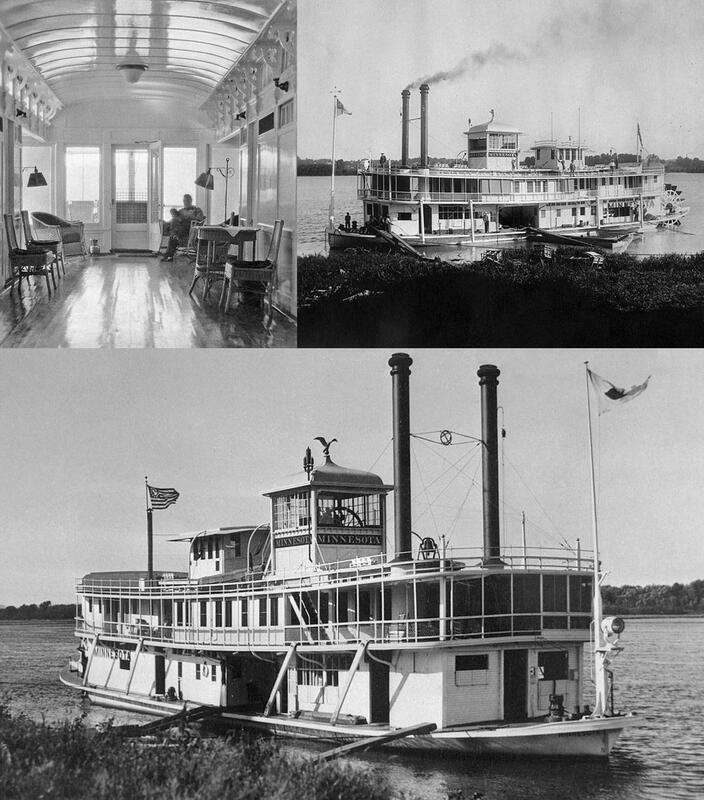 "Mayo and the Mississippi : A Passion for the River"
This hardcover coffee table book is devoted to the Mayo Bros. and their enjoyment with their family and friends on the Mississippi River aboard the sternwheel steamboats ORONOCO and MINNESOTA and the finally the more conventionally styled yacht the NORTH STAR. The attached elevation drawing of the MINNESOTA is in the collection of the Lilly Library at the University of Indiana at Bloomington It is reproduced on the front fly leaves of "Mayo and the Mississippi : A Passion for the River." 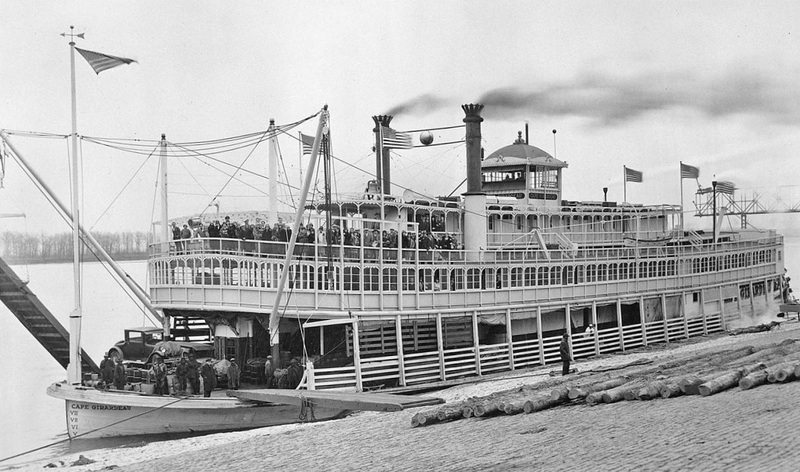 She was originally the MINNESOTA, a pleasure boat for the Mayo Brothers. Sold to the St. Paul District, U.S. Engineers in 1922 and renamed GENERAL ALLEN. She generally towed on inspection trips. She pioneered the first commercial tow for Federal Barge Lines out of Minneapolis, Minnesota, May, 1926 under the command of Captain William Henning. Originally the WYNOKA was to have handled the first tow, but she ran aground at Island 17 and the GENERAL ALLEN then completed the trip. She also pioneered the first modernized tow of Federal Barge Lines, arriving at St. Paul on August 24, 1927 with two loaded barges. In August 1939, GENERAL ALLEN was sent up the Minnesota River with a quarterboat, derrick and three barges and ascended 30 miles up to Shakopee, Minnesota. The tow had to be broken to get around some of the bends. Years earlier, the PURCHASE had made the same trip, but no boat had since been up until the GENERAL ALLEN's adventure was made. The Central Barge Company bought the George Allen from the US Engineers, Rock Island, Illinois in 1943. They restored the original name of MINNESOTA. Dramatic display of the serpentine course so typical of the much of the Mississippi River. 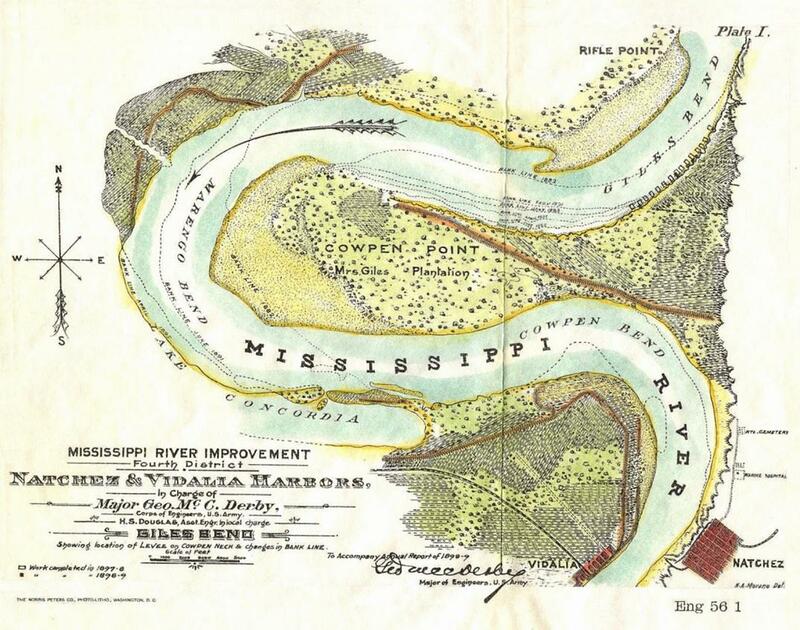 This hand colored Map from the 4th District of the Mississippi River Improvement in the vicinity of the harbors for Natchez, Mississippi amp; Vidalia, Louisiana shows GILES BEND amp; the levee on Cowpen Neck amp; changes in the bank line. Drawn and published in 1899 under the supervision of Major George Mc. C. Derby, Corps of Engineers U.S. Army. 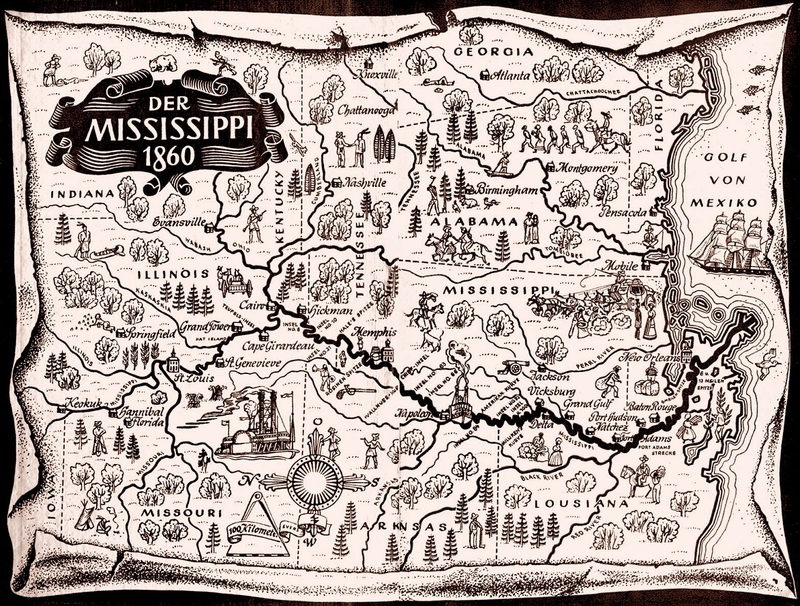 Pictorial map for the front fly leaves of a German translation of Mark Twain's LIFE ON THE MISSISSIPPI ("LEBEN AUF DEM MISSISSIPPI") represents the Mississippi River in 1860 by illustrator Heiner Rothfuchs (1913-2000) for a 1949 German edition published by Kesselringsche Verlagsbuchhandlung, Wiesbaden. The stylized pen and ink style Rothfuchs employed is very nostalgic evoking the U.S. during its frontier period with costumed characters, a steamboat along with cities and towns. The way the map was attached within the front cover caused a slight gap that is visible down the center but the graphic still reads satisfactorily.